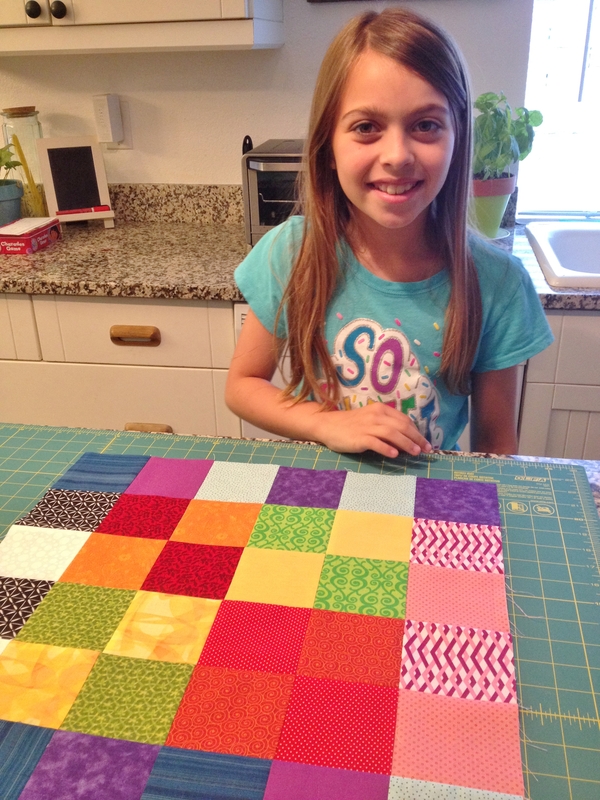 I’ve been wondering lately what is a good age to try and teach my daughter how to make a quilt. She’s 9 now. Sorry 9 1/2, as she would correct me. I tried to teach her a little over a year ago. While she was interested and excited to learn, her attention span wasn’t there. Yesterday I decided to let her try again. I figured a pieced pillow would be a great starter project. I let her raid my scraps and pick her own color palette. She went for a rainbow and added some black and white. I briefly talked to her about how to measure the pillow and figure out how many squares we needed to cut, explained adding 1/2 inch to each block for the seam allowances. Of course I pressed and cut all the fabrics for her, but she watched so I could explain what I was doing. Then I let her make her own block layout. 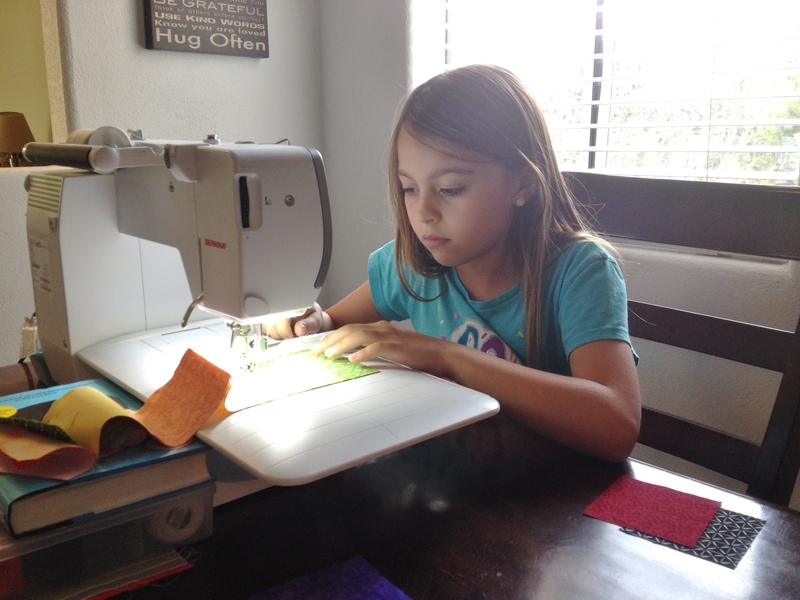 I sewed the first 2 blocks together to explain the 1/4″ seam allowance but let her sew each row together by herself. She did so well with her seam allowances. 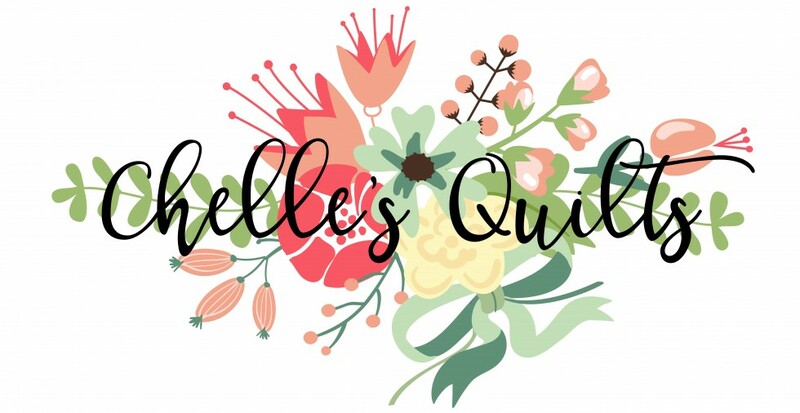 Having my Bernina 550 QE made such a huge difference from when I tried to teach her before. My new machine has a sliding guide bar that I have lined up against my 1/4″ foot so that it’s easier to keep my seam allowances perfect. I really love my Bernina! It’s made such a huge difference in the quality of my work. After piecing together the individual rows, I started pinning the rows together for her. 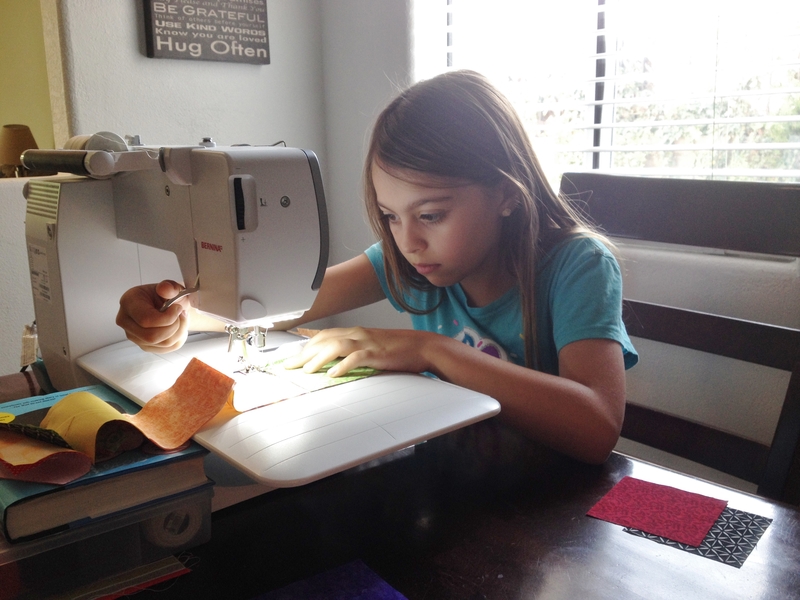 I explained to her that she had to be careful when sewing rows together to watch out for the pins. After explaining that she could break the needle by hitting a pin, she got nervous and asked that I join the rows for her. So I did. Here is her finished pillow top. 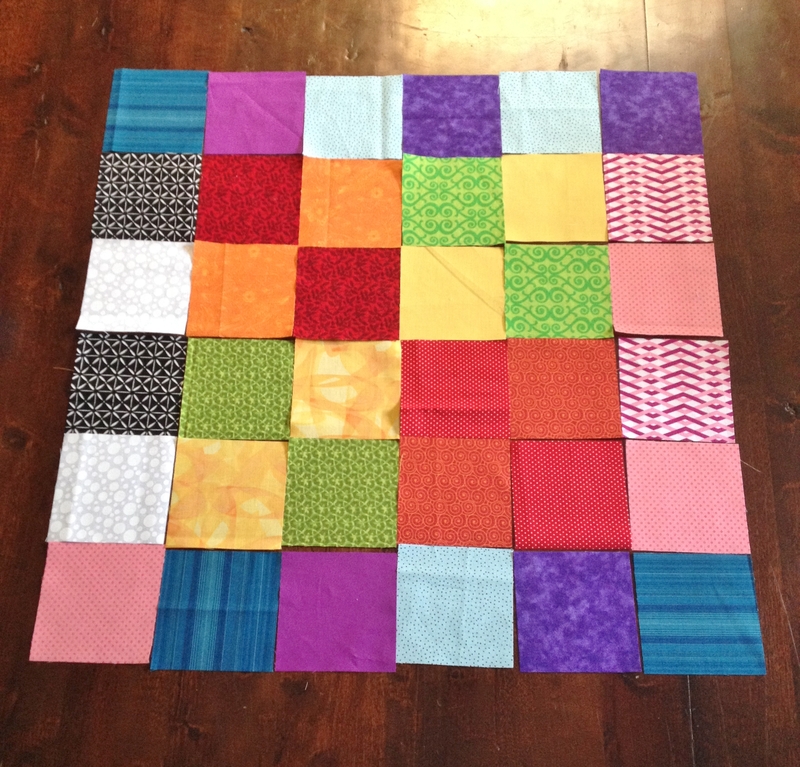 Next I sandwiched everything together for her and got it ready for quilting. I did one line of quilting for her just to show her how, but she did the rest of the quilting herself. Wow! 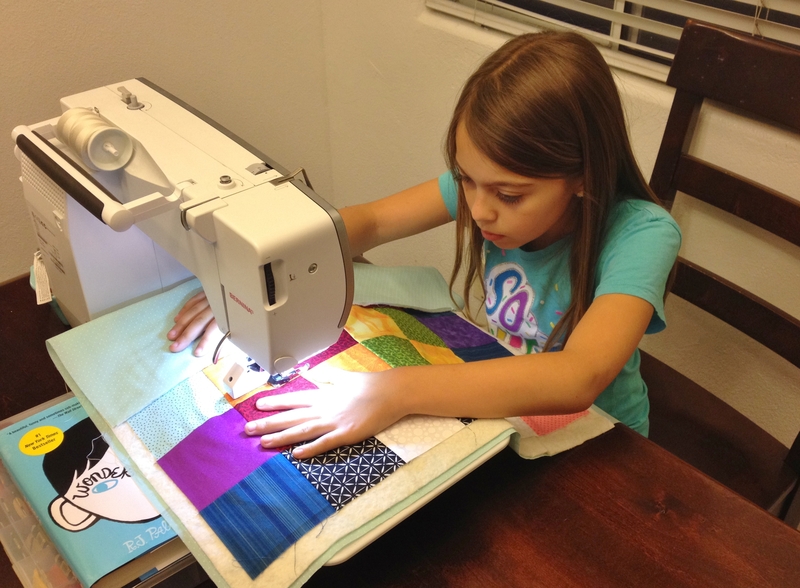 I was amazed at how well she did keeping the quilting straight. She did a much better job that when I quilted for the first time at age 31! It was getting close to bed time, so I quickly sewed the back of the pillow onto the front for her. I’m sure she would have done a great job, but she wanted her finished pillow rather than continue the project later. She was so proud of herself and I’m so unbelievably proud of her! She’s already talking about her next project. Just like mama. 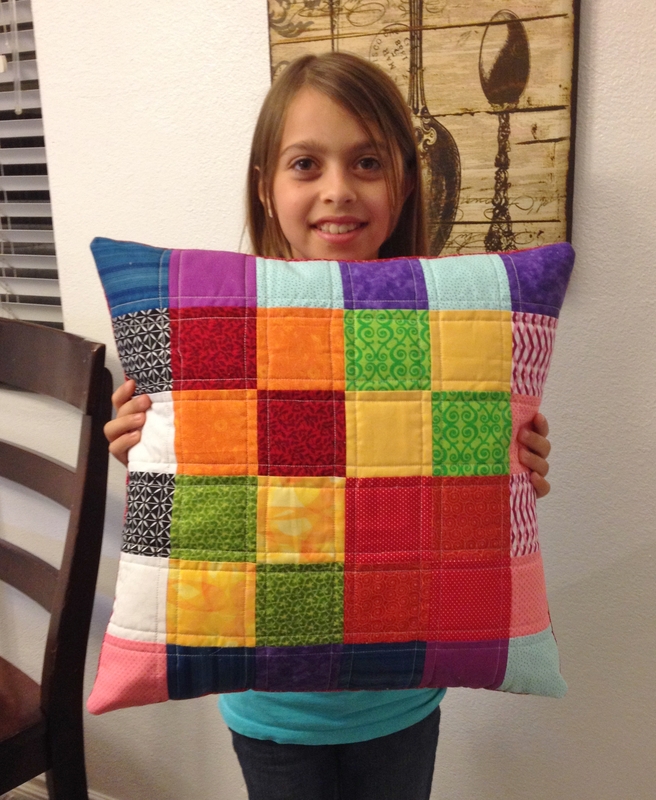 She even offered to teach her 8-year-old brother to make a pillow. He wants to come home from school today and pick fabrics. Stay tuned.